In 2010, my wife and I moved into a home built in the early 80’s. One of the first things we did was replace most of the kitchen appliances that had been there since the original owner moved in. Eight years later, all of our appliances have now been replaced due to age, or having broken down. Our water heater lasted longer than it should have and was eventually replaced a few years back. It’s a Whirlpool dryer, model #LG5801XSN0. I couldn’t find a manufacture date on er, but pretty sure it’s from the mid-80’s. And, she’s still going strong. Well, sorta. It could certainly use a new belt and tune-up but it’s gone through a LOT of loads in those years. 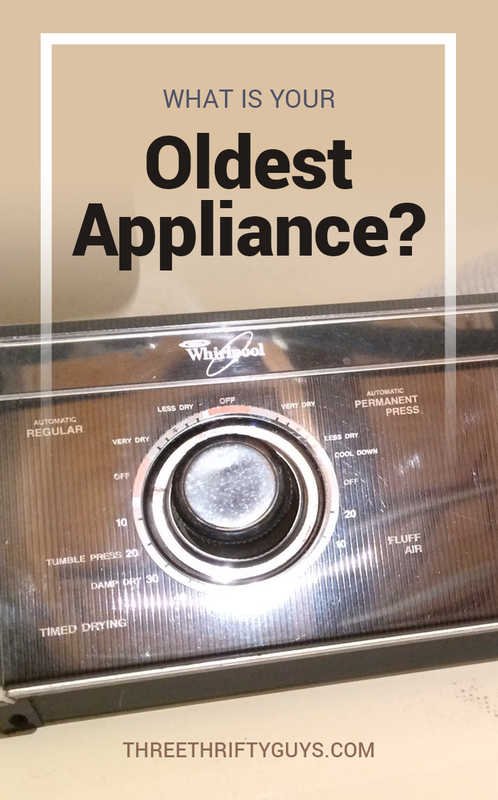 Why do the older appliances seem to last longer? Seeing our good ‘ol faithful dryer got me to thinking about how a lot of these older appliances seem to last longer than the newer ones. I’m not sure you’ve found this to be the case, but we’ve personally experienced some major manufacturing flaws in a couple of our more “modern” appliances over the 8 years of living in our current home. One of these breakdowns actually caused enough damage that we ended up tearing up our kitchen and replacing the flooring (the dishwasher had a slow leak that caused the flooring to bubble-up). There’s got to be a reason why they’re not lasting, right? There are fewer appliance makers than years ago. Many of the major appliance manufacturers have bought up the competition. Less competition = bad deal for customers. Parts are designed to fail. How is it that we haven’t progressed in the manufacturing of long-lasting, durable appliances, like we have in almost every other human endeavor? Perhaps this is on purpose. In our throw-away culture, we don’t expect major purchases to last more than 5-10 years (and sometimes less). We’ve almost been educated to accept it. Of course there are ways we can prolong the life of today’s appliances. Refrigerators. I’ve written before about extending the life of refrigerators. One of the things you can do is clean the coils / vents regularly. Also, keep it full, within reason. And, don’t block the vents. This will help aid proper air flow within the fridge. Dishwashers. After our mishap, my wife wanted to help others prevent what happened to us and wrote about ways you can lengthen its life. One of the things is the opposite of your refrigerator: don’t jam it full. Another: clean your dishes before putting them in. Dryers. The more obvious one: clean the lint out after every load. I’d be interested to know what the oldest appliance you own (and how you’ve managed to keep ‘er working). I wish I would have kept my dryer. It was a 70’s green dryer given to me by my in-laws, in the early 90’s, so probably about 20-25 years old when I first got it. I sprayed it white with appliance paint after a few years. I don’t think I ever had to repair anything. I bought a new one in 2009 because I could afford it and the door broke and I had to prop it shut. I wish I wouldn’t have gotten rid of it. I have already had to repair my newer one. I have a houseful of 12 year old appliances. So i have been think replacing them as soon as possible. But some appliances are still work properly so i want to decided replace these items which is not work properly. If you had more insight i will greatly appreciate it. I have a houseful of 15 year old appliances, from when the former owner remodeled. I’ve had repairs on the fridge, stove, dishwasher, and dryer. And without exception, the repair person has said, “keep this as long as you can… they don’t make ’em like this any more.” Not sure how we became such a throwaway culture. Always interesting hearing that from a repair person. Oh, funny! Well, they made a good one there. You’re probably right on the efficiency though. That’s the one thing the newer appliances have on the older appliances. Could spend more operating them. Never heard of the Speed Queen, Sue. Had to look it up. They’re actually selling ’em on Amazon. Really washers and dryers, I have always bought the lowest-of-the-line (Sears) without all the “fancy” choices. Most people use only the basic choices anyway, and there is less to go wrong. Therefore, in my adult life, I have probably had no more than 3 each (maybe 2, not sure). I’m 81. Smart thinking J – going with the basics. We bought our house brand new in 2005, and it still has our original appliances. So we are going to have to save up for replacing them soon! Hitting that 10+ year mark!